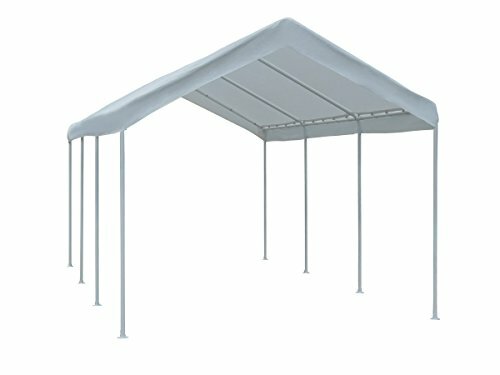 Carports are used to provide protection for one or more vehicles against the elements, though they can also double as gazebos for unique events, or for routine use on the lawn. They are the perfect alternative to a fixed garage, either where space or planning permission doesn’t allow, or where the building cost is too high. Most support frames are built from steel or aluminum, with the panels typically being a material such as PVC, polycarbonate or polyethylene. The type of material will normally depend partly upon the price tag, though all provide good protection against all kinds of weather. Browsing the carport market and selecting a high-quality product isn’t always easy. So to help you out, we’ve put together a group of the top 5 carports available right now, as well as their benefits and drawbacks. The Palram Vitoria 5000 is a versatile, all-year-round carport structure that makes a high-quality alternative to a fixed garage. There’s space for a single vehicle to be stored beneath the polycarbonate panels, and this product is the easiest to disassemble and reassemble of any of the products that we’ve looked at. The polycarbonate panel components are bronze-tinted and virtually unbreakable, with a tough, 6mm twin wall. Even under extreme weather duress, they'll easily maintain their integrity and what's more, they provide complete protection against UV rays. Even over time, they won’t thin or become brittle. These panels are coupled with a rust-resistant aluminum frame that is far cheaper than solid steel, with the steel material being reserved for just the connectors. All these components are pre-drilled and ready to assemble. It’s easy to adjust the support beams on this carport, making it movable if it’s needed elsewhere on your property. Though extremely durable, there’s also a massive 10-year limited warranty, which is far longer than most cheaper alternatives. Since the polycarbonate panels are virtually unbreakable and shatter resistant, it’s unlikely you’ll even need this coverage. Despite being very durable overall, this carport lacks any side panel protection, letting in rain in stronger winds. The material also tends to be sensitive to vibrations, so can be noisy when slamming car doors and so on. It’s also worth mentioning that this carport only has the option of supporting a single car. The Quictent 20 x 10 carport is similar in design to many others on our list, in that it uses a polyethylene and steel design in its construction. Where it differentiates itself is in the inclusion of side panels, or walls, which reduces the impact that weather and other factors may have on the car stored within. The polyethylene fabric used in the construction of the cover plus all exterior panels is extra-thick, as well as being fully waterproof and tear-proof. The latter advantage means that a build-up of snow and ice isn’t likely to tear the fabric. What’s more, the fabric also has built-in UV protection, ensuring that your white carport won’t turn yellow after being bleached by the sun over time. The product is delivered inside of reinforced packaging, which uses a wooden bracket to support the exterior box and prevent damage to the components. Many carports come with a single cover to protect the cars stored within from rain, but don’t necessarily include side panels. Conversely, the Quictent has coverage all around, except for the entrance / exit. This increases protection against side-blowing wind and rain. The powder-coated steel exterior prevents the steel support frame from rusting as easily as exposed metal does. Lastly, the reinforced packaging in which this product is delivered helps to offer protection to the components. Though you shouldn’t expect it otherwise from a budget-range product, the Quictent 20 x 10 carport is not fire retardant. This generally won’t be an issue when kept outdoors, but it’s still worth bearing in mind, especially if using the product as a gazebo in the presence of a barbeque, for example. There is no optional coverage for the built-in windows, so you can’t shield your possessions from would-be thieves. What’s more, the side panels also increase the propensity for gale-force winds to push over the carport. The King Canopy carport is the most budget-range of all the carports on our reviewed list. Around for several years, the product has generally garnered fairly positive consumer feedback, despite being one of the most basic on our list. 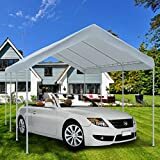 It makes the perfect temporary carport, or alternatively serves well as a gazebo for lawn parties or other fair-weather uses. 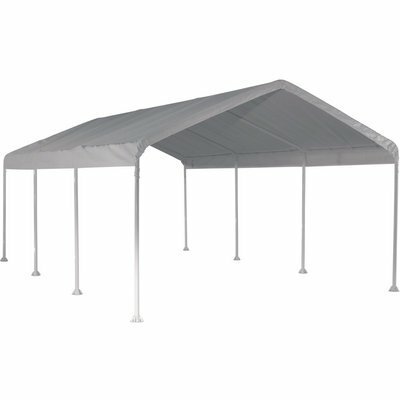 The King Canopy Universal Canopy comes in a single size of 10 x 20-feet. It's supported by 6 legs, which are crafted from 20-gauge, powder-coated steel, also white. At the center, it's 8 feet 11 inches tall, and 5 feet 10 inches at the sides, so there's space for a car or a truck. The canopy is both waterproof and UV-treated. The product includes drawstring ends and curtain clips. Though it shows in the design, the fact remains that this is the cheapest carport on our list, which makes it a bargain for somebody looking for a temporary solution, or a basic level of protection. No rainwater can get through the canopy, so provided the wind isn’t high, your vehicle will stay protected. For a low cost product, it’s also good to see that the polyethylene fabric is still UV-treated and thus should not turn yellow when exposed to the sun for extended periods. 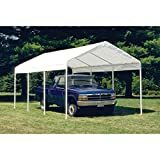 The King Canopy carport is the cheapest of those that we’ve looked at on this list, and it shows in the design; the whole thing looks very basic. 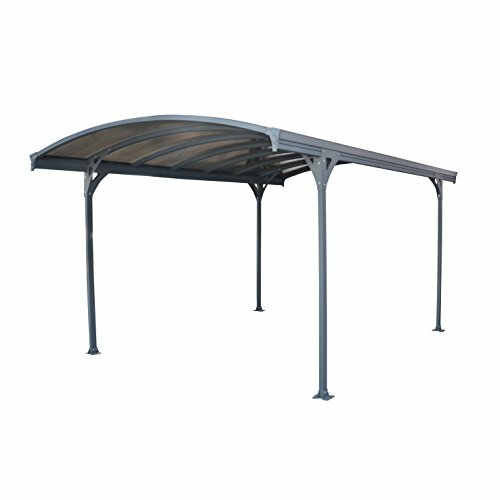 As a single canopy, the product offers no side-wall protection against the elements, and the whole thing is supported by thin steel frames. Finally, as is often the case with low cost products, the whole thing is transported in a cardboard packaging without support, which can result in the package becoming battered in transit. The Abba Patio Car Canopy isn't the cheapest one around, but it's still a reasonably low to mid-range product. 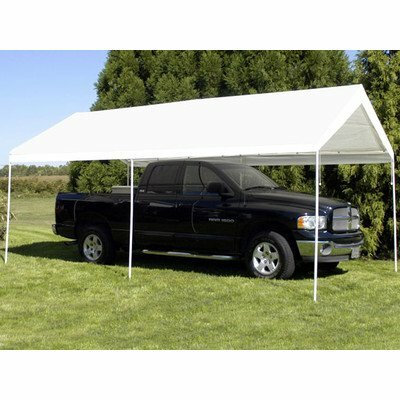 It’s ideal for use as a single vehicle carport, particularly for larger trucks and other vehicles, and it's simple to put together. Weighing in at 110 pounds, it’s a fairly straightforward task that can be managed by a single person. This is a 10 x 20-ft., 8-leg canopy that can store a single vehicle at one time. It takes approximately 30-60 minutes to install for the average person. The canopy is built from non-fire-retardant polyethylene, with a supportive frame that's made from white powder-coated steel. The package includes 20 ground stakes and 4 pieces of rope for strengthening the support, as well as 46 bungee cords. Despite the lack of instructions, installation of this product is straightforward and quick to complete. Also, in spite of a low-price tag, the product has 8 steel poles for support, as opposed to the 6 you would normally expect from a more inexpensive product. There’s plenty of space inside, meaning that this carport would be ideal for larger trucks, or for using as a party gathering space. Though it’s to be expected from a lower-end, cheaper product, the packaging receives the same complaints as many of these heavy products, in that it can become battered in transit. It also lacks any kind of installation instructions, although working things out without them isn’t too tricky. Finally, and most importantly as the biggest drawback, this canopy doesn’t have enough support to withstand heavy snow and ice. 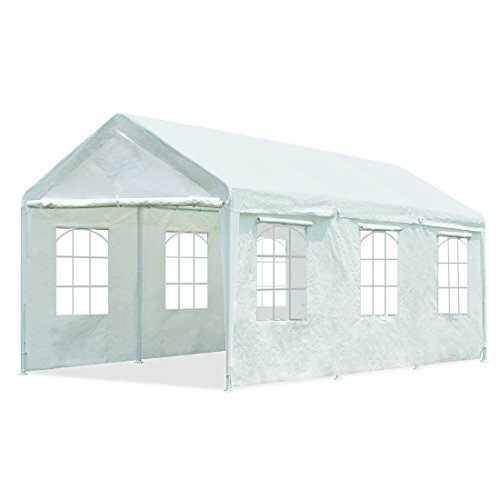 The ShelterLogic 12 x 20-foot carport is a reasonably low-end product as far as carports go, though it’s not the cheapest on the list. It’s the ideal size for a single vehicle, and can even be altered to be taller, though it’s worth noting that doing so would void the product’s warranty. The ShelterLogic carport uses a combination of polyethylene and steel. The former material creates a 12 x 20-foot canopy that sits atop a frame built from powder-coated, heavy-duty steel 2-inches thick, and the material is also resistant to rust. Additionally, the cover is waterproof and angled to allow for the runoff of rainwater. The polyethylene cover is CPAI84 certified, which doesn’t make it completely flame retardant, but does offer a good level of protection against flames. In terms of design, the height of the support legs can be raised further from the ground if additional components are added, though these aren’t included. Anchors are also included, which can be used to strengthen the anchoring of the product to the ground; this makes it less susceptible to being torn down by strong gales. This carport uses a polyethylene protective roof, much like the other fabric-based carports we’ve listed above, though the cover of this product is thinner than the others. As a result, if mother nature dumps a great deal of snow and ice onto the cover, you could have trouble with buckling support poles or even tears in the polyethylene fabric. Finally, the packaging that the manufacturer uses is quite flimsy; as the connecting pins are stored loose and not bagged, damaged packaging could result in lost pins. Though we’ve already looked at 5 of the most popular carports available, below we will examine the different key features of a good carport and what you should look for if shopping for yourself. Most carports opt for a reinforced fabric-based design unless you’re paying a premium for a higher quality product. The benefits of such fabric, including polyethylene, is that they’re normally UV-treated to prevent discoloration, and often have other qualities such as being waterproof or tear proof. The alternative is harder, solid panels made from materials such as PVC or polycarbonate. In terms of durability, these are typically the better of the two design options, as they offer better durability and protection against the weather, long-term. Your carport frame is the structure that holds everything together, so it needs to be strong enough to withstand the elements, as well as quite an amount of weight. Your typical carport frame will be crafted from galvanized or non-galvanized steel, or aluminum. Aluminum is preferable from a lightweight point of view, but steel is most common in the lower end of the budget range. Carports typically come in slanted, or pointed designs, or as a flat roof. The former is a useful design choice, as it allows for rainwater to easily run away instead of pooling on the fabric. Using a flat canopy roof can result in an accumulation of water, or snow, and this could result in the fabric tearing. That said, any good flat-roofed design should include design features that prevent the pooling of water. You should consider exactly how you’re going to mount the support legs to the ground; some can be cemented into the floor, whereas others use bungee cords, stakes, and other forms of anchoring to secure the frame and canopy to the ground. Without these accessories, your carport could fly away in high winds, so you’ll need to ensure that there is a strong or heavy anchoring to the ground, if not to some other secure, solid surface, such as an exterior wall. 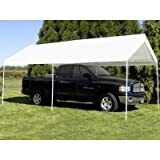 ​Why do I need a carport? Not all homes come with a garage, and without some form of cover above your car, you’re missing out on a range of benefits. A car exposed to the elements is more susceptible to damage, or at least inconvenience; for example, bird feces can strip away vehicle paintwork, or thick snow and ice will have to be scraped away from a car before it can be driven. ​What material is better for a carport? Carports can be bought in a range of materials, and the material used will largely determine the price. Polyethylene is common for fabric-based carports and is extremely tough, being tear-proof in many cases. Polycarbonate, or PVC is also popular for the more expensive and more durable options. When it comes to the support legs and frame, steel is used almost exclusively. Galvanized steel is best, and powder-coated variants help to prevent rust. ​What is better, a carport or a garage? Structurally, carports are clearly less sound than fixed garages. In areas that see a lot of adverse weather conditions, this might not be suitable, as gale force winds could tear down a carport if it’s not sturdy enough. On the other hand, garages are built to withstand more heavy weather and will offer greater protection to the cars stored within. ​Can metal carports be moved? All the carports we’ve looked at above are made from a combination of varied materials; in most cases, the metal materials are within the supportive frame, and often the metal used is steel. Steel is reasonable heavy and thus can be hard to move around easily; however, the Palram Vitoria carport, for example, uses lightweight aluminum, which makes it far easier to move. It’s also worth noting that the assembly of some of these carports will be easier in some cases. In summary, it’s possible to move carports, but some will be easier than others. Carports can be set up in any location; in fact, setting one up close to a fixed wall, such as the wall of a house, can result in greater protection against the wind and the rain. Theoretically, you could also enclose a carport indoors, though there wouldn’t be much benefit in doing so, unless using the product as an indoor gazebo for a social event. 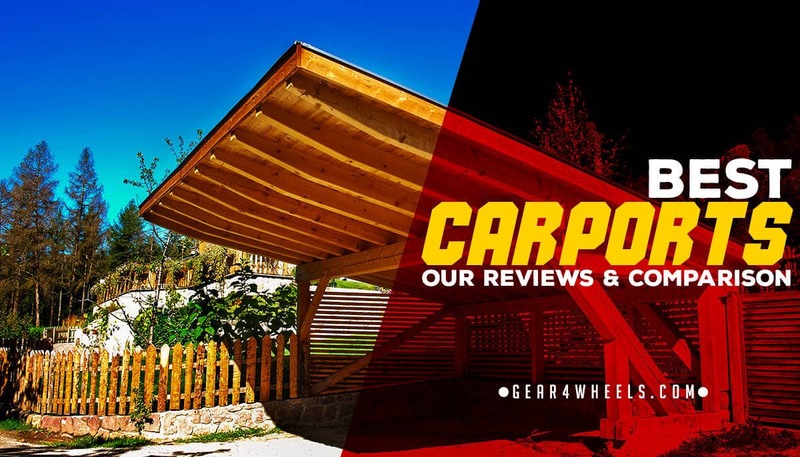 From the above reviewed items, our pick of the bunch is the Palram Vitoria Carport. It’s the most expensive one on the list, but it’s also the only one that opts for a solid panel design, which offers the greatest long-term stability and durability out of any of the carports listed. Not only will this product protect a sheltered vehicle against adverse weather, but its shatter resistant panels can also withstand impacts from small tree branches and other debris.